Distinctive features Blitzkrieg has a muscular build. He has handsome features and a strong jaw line. He wears his hair in a crew cut. History After World War II, Nazi geneticist Jerg Kemptner continued his work in cloning in the name of the Fourth Reich. He obtained cell samples from the original members of the Sentinels and began growing clones of them. Kemptner slightly altered their genes to grant them different megapowers from the originals. His work was stopped by the Sentinels, who did not know about the clones. The clones grew in a hidden chamber of Kemptner's lab until they were discovered and freed. Personality Blitzkrieg believes he is a prime example of the Aryan dream: blond, handsome, and superior to everyone else except his own kin. He seeks to restore the Fourth Reich as the world government of the 21st century. In combat he becomes an obsessed killing machine, showing his foes no mercy. 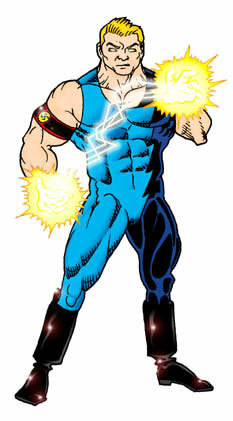 Powers Blitzkrieg can project powerful bolts of electricity from his hands or eyes, and is invulnerable to electrical attacks. He has megahuman strength and speed, and can leap vast distances or run at great speed. He can regenerate from nonfatal attacks in a matter of hours. Skills Blitzkrieg is skilled in weakness detection (he can sense the weak point of an object and inflict extra damage by striking there).